Jo-Anne Yelen: Born in 1959 in South Africa, Jo-Anne grew up in a remote and beautiful rift valley in an otherwise arid landscape. Her parents ran an adventure camp for city children and Jo-Anne ran wild throughout her childhood. Having decided, due to the remoteness of their home, to home-school her children, Jo-Anne’s mother, an artist, would set work for them and then become lost in her latest painting. The children could then sneak off to less onerous pursuits. As Jo-Anne and her brother grew older their schooling, if not their education, became more routine as they studied under the guidance of correspondence colleges. In 1976, having finally decided that they could no longer manage in a system that included apartheid and with no sign of change evident they made the difficult decision to leave South Africa and return to the home of their ancestors, Ireland. Knowing very little of Ireland Jo-Anne’s family roamed around the country in search of a place to call home and, eventually, in 1978, they settled in the village of Sneem where they built a studio where the family passion for the arts could be pursued. Jo-Anne, then 18, began to dedicate here energies seriously to painting and, somewhat less seriously, to shoestring travel. Under the expert tutelage of her mother M.A.Muller, now at last teaching where her true interests lay, Jo-Anne rapidly began to develop a style all her own that has over the years come to be known as Jo’ism. During the past 25 years Jo-Anne has followed her compulsion to paint, through the growth of her family (two boys), and continues to gather enthusiastic patrons from all walks of life and every continent. Her work is instantly recognizable no matter how far-afield it may be found and, due to its unique style, appeals to people on many levels. Investment collectors buy Jo-Anne's paintings because they actually like them. 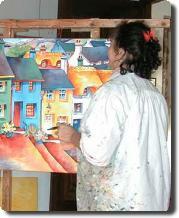 All Jo-Anne’s paintings are produced with the finest quality materials. Canvass is heavy linen or cotton artists grade canvas - Watercolour paper is 300 lb St Cuthbert’s Mill Waterford Saunders - Paints are Windsor and Newton Selected list only and are the most permanent pigments ever produced for artists. Jo-Anne’s work hangs in private collections all over the western world and the middle east, including the Anne Stevens Collection (Ford USA), and has recently been added to the great collection of art works in the castle of the Zu Luvenstein family where she hangs in the company of old and modern masters. On First arriving in Ireland a virtual refugee in the bleak winter of 1977 I lived with my family for some months in a run down rented caravan on a windswept lot in Swords Co. Dublin, as it was then! Having just emigrated from a tropical paradise my entire family were in a state of climatic shock and began suffering somewhat from depression. I kept noticing artworks in public places which, while expertly rendering the environment and climate (stark Skeltons spring to mind), were doing little to remedy my mood. I therefore took a conscious decision that any painting I produced must, as part of its purpose, uplift the viewer and evoke a positive response from the psyche, no matter how depressed. I have always held true to this fundamental, notwithstanding the natural style changes and evolution that an artist must go through to maintain their own interest and, thus, a freshness in their work. That sounds to me like an addiction. So why painting in particular? So what else interests you? So if painting is a primary form of expression for you how do you avoid this? So you feel happy most of the time? So this could be likened to the endorphin rush that is obtained by athletes when they train. Do you paint every day? But what about a change in style like your development of thruism? OK I have got a good idea where you are coming from in your art. What about other artists, what is your opinion of contemporary art? So you have a problem with the media?